two million bottle cellar and extremely smart visitor centre by the end of 2018. The team at Hambledon Vineyard are delighted to support THE PIG & Lime wood with their Smoked and Uncut Festivals with the unveiling of the Hambledon Bus Bar. We here at the vineyard, can’t wait to commence the bus tour starting on Saturday 16th June in the New Forest. Get ready to party in style on the famous Hambledon blue, double decker, luxury bus complete with it’s English Sparkling Wine bar. Roll up…roll up…all aboard! Street-food feasting, day-long drinking, dancing like no one is watching and sleeping under the stars, the tag line for these amazing Smoked & Uncut festivals. This sums up the atmosphere perfectly. A series of food and music festivals hosted at THE PIGs & Lime Wood Featuring our very own Hambledon Sparkling wine. We are so proud to be part of this amazing company, that supports its local producers so well. 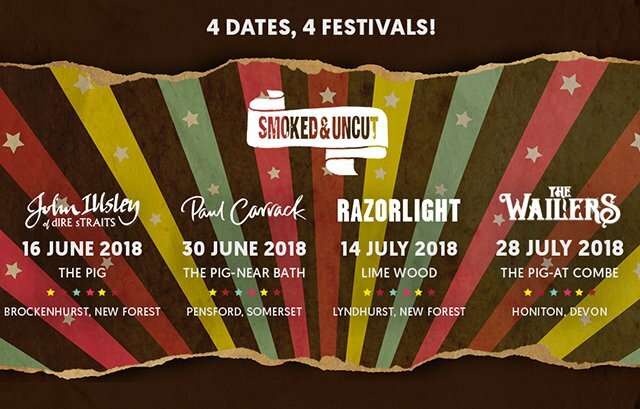 This year Smoked & Uncut returns to Lime Wood with live music, rock 'n' roll, the understated luxury of a glamping village and the rustic styles and flavours of the street food stalls. There will even be a VIP feast cooked up by Chef Mark Hix, Angela Hartnett and friends on both the Saturday and Sunday events. Make sure you really don’t miss out!